On Wednesday afternoon, Upper Deck announced on its UDA Facebook page that it would hold a special promotional contest (starting immediately) for Green Bay Packers fans with an autographed (and personalized) Packer full-size helmet from starting QB Aaron Rodgers in the balance. Simply show us why you should be deemed the “Ultimate Packers Fan” and you could walk away with a personalized helmet from the team’s starting signal-caller. With UDA holding a autograph-signing session with Rodgers next Monday, we could turn the authenticated prize around in no time. The contest concluded just moments ago. And after sifting through the various entries and discovering that we had two more items up for grabs (a soon-to-be personalized football from Rodgers as well as a Packers mini-helmet), we selected three die-hard Green Bay fans worthy of walking away with something special from UDA. The grand prize of a full-size Green Bay Packers Riddell helmet is going to Jeff Rae of Grand Rapids, Michigan. 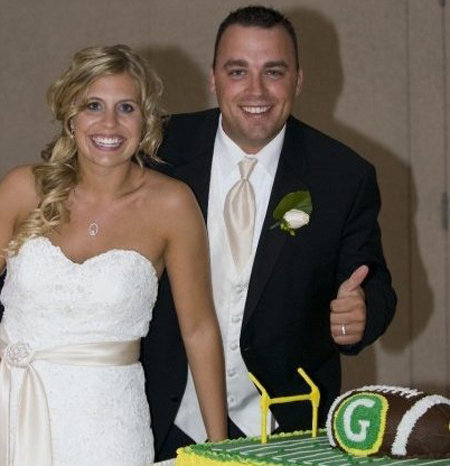 His photo submission, which shows he and his new bride, Allison, about to cut their Green Bay Packers decorated wedding cake, screamed volumes to the internal judging committee and earned he and his wife top prize. Congratulations to both Jeff and Allison. 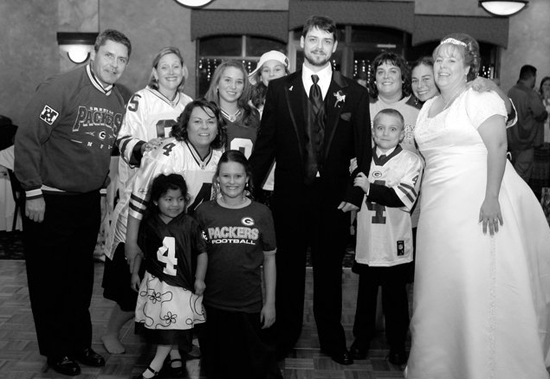 Jeff and Allison: Congrats on your nuptials as well as winning top prize in Upper Deck’s Ultimate Packers Fan Contest! The runner-up prize, which will be the personalized football from Rodgers, goes to Pat Ebben of Neenah, Wisconsin, who submitted yet another wedding photo showing how passionate he, his friends and family are about the Pack. Check out the photo below to see how rabid they are as Green Bay fans. Pat: Your newly earned Rodgers-signed football will make you stand out in the crowd. 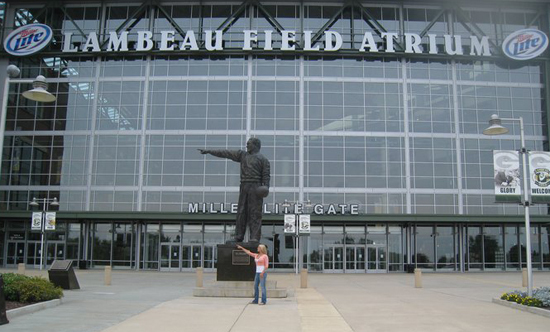 Third prize, a soon-to-be personalized Packers mini-helmet from Rodgers, goes to Emily Nosches of San Diego, who submitted the photo below showing her standing in front of Lambeau Field (directly in front of a statue of Curly Lambeau) with a note that read: “My Great Grandfather played on the first Packer team with Curly Lambeau…no big deal. This was me visiting Mecca. GO PACK!” Congratulations to Emily for her strong bloodlines! Emily: Pointing the way to her latest and greatest signed keepsake from Upper Deck Authenticated. We’d like to thank everyone for their submissions to Upper Deck’s Ultimate Packers Fan contest on Facebook. Your participation is what makes this hobby great. Keep on collecting and best of luck to you, Aaron Rodgers and the rest of the Green Bay Packers this season! LeBron’s Game-Used Shoes: Win a Pair! LeBron Game-Used Uniform Now Up at Auction! Bracket Town: Upper Deck’s in Houston This Week! What’s Wrong with the Heat?